For the cauliflower steak, melt 2 teaspoons of the coconut oil in a nonstick frying pan over medium-high heat. Add one cauliflower steak and cook, turning once, until golden, 2 minutes per side. Transfer to a prepared sheet and season with salt and pepper. Repeat this process with the remaining oil and cauliflower steaks. Place in the oven and roast until the cauliflower is tender, 12–15 minutes. and olive oil. Season with salt. For the sautéed greens, bring a saucepan of salted water to a boil. Blanch the broccolini until almost cooked through, 1 minute. Plunge into ice-cold water, then drain. Set aside. Melt the coconut oil in a large frying pan over medium heat. Add the garlic and cook until fragrant, 20 seconds. Stir in the Swiss chard, broccolini, and 2 tablespoons water, and cook, tossing occasionally, until the Swiss chard is slightly wilted and the broccolini is heated through, 1 minute. Toss in the hazelnuts and season. Heat the coconut oil in a nonstick frying pan over medium heat. Fry the eggs for 2–3 minutes, or until cooked to your liking. Season, slide onto a plate, and keep warm. 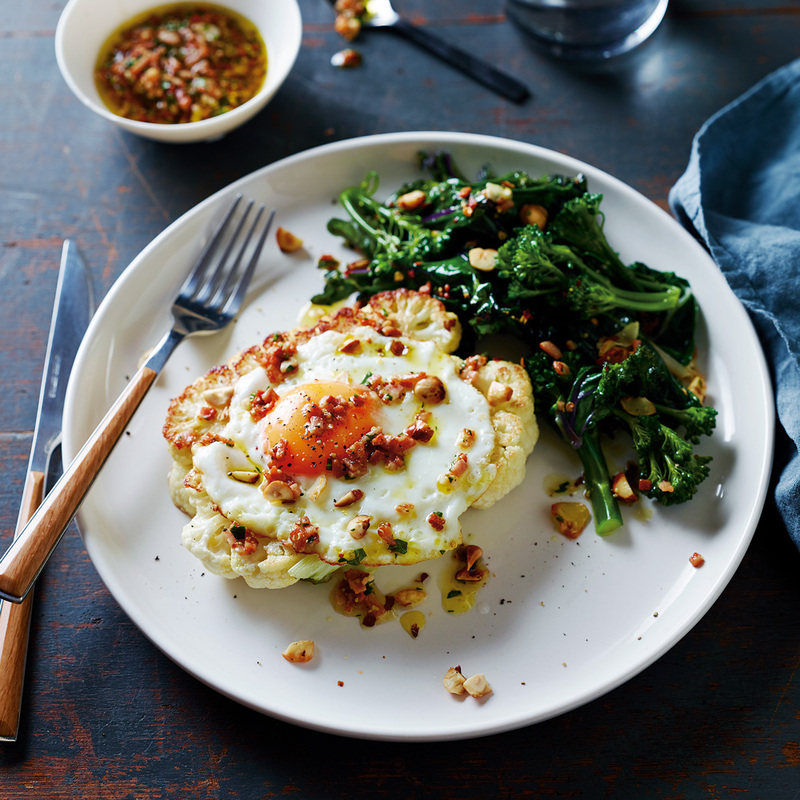 Place the cauliflower steaks on warm serving plates, and top each with a fried egg. Add the sautéed greens, drizzle with some bacon vinaigrette, and serve the rest on the side. Review Body: This was so easy to make, fast and delicious. I used Sweet Earth Benevolent Bacon to make it veggie. I didn't do the greens part-just sautéed spinach from a bag in coconut oil which turned out super tasty and quick. My picky 4 year old couldn't get enough of the spinach. My hubby and I couldn't get enough of the rest. Will use it for brunch next time.